Our latest addition to the wide reaching reports of Kobas is a new weekly email detailing key performance indicators across your business, focusing on operational efficiency across sales, stock, and staffing at each of your venues. In our dedication to providing insights through data, this email looks far beyond just numbers. Pulling in a host of information that can help explain variances or aberrant figures, this report can assist you in spotting patterns and trends that might indicate areas in which your business can become more efficient. This information is also stored in tables that can be copied and pasted directly into Excel for instant analysis. That said, this report is sent first thing on a Monday morning, and so we’ve included headline figures for weekly sales and stock; the perfect reading to start your week with. Alongside your holding stock totals, we’ve included a list of any outstanding orders. Detailed here are any orders that have not been fully processed in Kobas, featuring the date the delivery was placed, the target delivery date, the supplier, and the staff member who placed the order. Kobas EPoS logs almost every key press that enters the system, and this report gives you a breakdown of any compensatory orders that have been rung through the till, as well as a list of all no sales, items that have been removed from a basket. So, if you are down on a particular line, this report will give you a large amount of data that can help you ascertain whether compensations are affecting sales, or if any suspicious activity may have occurred. All of this information is logged by time and date, meaning that you can trace any discrepancies to the minute. 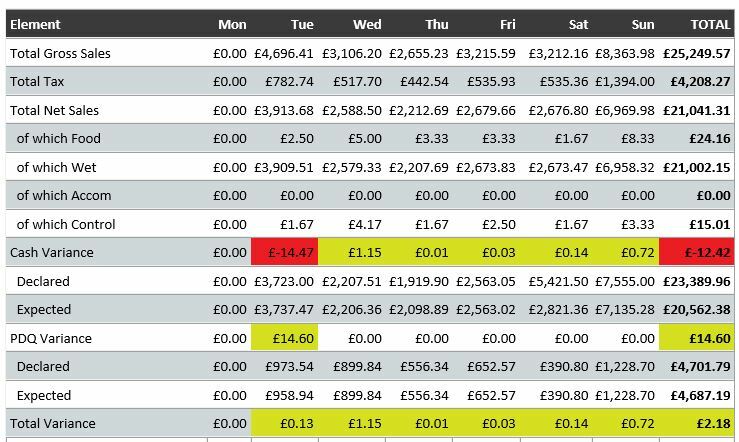 To give you a wider view of your overall staffing levels, this report also plots the number of days and hours that staff have worked against the total sales that they have taken in the week. So, whether your revenue per hour figures are down, or a particular member of staff has earned themselves a break, this report gives you the information that you need to move forwards. If you would like to begin receiving this report, please navigate to Administration > System Preferences and use the drop-down menu to select “Email Reports”. Once you’ve set “Send weekly email business summary report?” to True, you’ll then be able to add the email addresses that you wish to receive this report. Please note that any addresses that receive this report will receive one email for each of the venues in your account, so only staff that have permission to view all venues should be added here. We’ll be tweaking this report a little in the coming weeks to make it even more useful, but if you’d like to start using this feature right away: please do!